So yesterday was the first day of Indonesia's annual (or not?) festival, Java Rockin' Land 2011. And yes, I attended the festival, this is why I'm writing about it. Duh. I went up a bit late for We Are Scientists, the only band I wanted to see. By late I mean for only one song. But I was late. That's considered as late. Ok. I just got a ticket 2 days before the show, really unexpectedly so I haven't really prepared anything and I didn't memorise a single song. So I was at the back with Hanie and her boyfriend, screaming after each song. Considering I was the only one who did that, I stopped. So I was really quiet and I tried to sing along. I failed. I spent half of the show searching for my friends who were already in the crowd so that was quite a bummer. I must say that the crowd sucked. Including myself. Nobody sang. Only a few sang and the sound system was really bad, the mic went off for a few times and I felt really bad for We Are Scientists. For having to face such a bad, noiseless, motionless crowd, for having to play with mediocre sound system. My friends and I then went for a walk to eat and sat and do nothing. It was really unproductive while I could actually watch Blood Red Shoes or something. 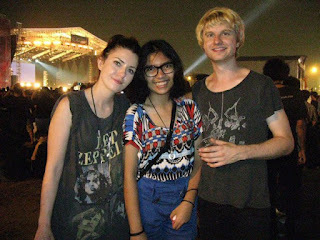 Long story short, Annisa and I bumped into Steven Ansell of Blood Red Shoes, so Annisa walked up to him saying she wanted a picture but Steven said he had to have his dinner and that he was sorry, he even promised that if we go to their backstage, he'd have a picture. So we were happy and strolled along the venue searching for Keith Murray. That was our point of walking around the venue, by the way. We didn't meet him. But instead, we were given a return of not meeting Keith with meeting Blood Red Shoes. Both Laura-Mary and Steven. We poked them and asked for a picture and ended up watching 30 Seconds to Mars with them, talking and stuff. They were really, really nice and friendly! Once we were done talking to Laura and just watched the show when she suddenly poked us and said something in which I forgot. I took another picture with them, individually and I was happy.